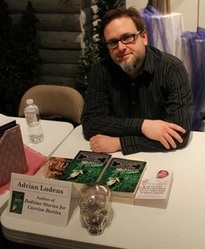 Adrian Ludens is a radio announcer and professionally published author from Rapid City, SD. His short fiction has appeared a variety of publications, including Alfred Hitchcock's Mystery Magazine, Shadows Over Main Street, The Mothman Files, and Blood Lite III: Aftertaste. His short fiction can also be found in the Stoker-nominated anthology Slices of Flesh, and more recently in Surreal Worlds, In Shambles, Darker Edge of Desire, Forgotten Places: The Best of the Horror Society 2014 and more. His debut collection, Bedtime Stories for Carrion Beetles, features nineteen dark tales of horror, steampunk mystery, supernatural suspense, and the Weird West. Bedtime Stories for Carrion Beetles is available. He is compiling stories for a second collection, When Bedbugs Bite, due in August. Adrian recently collaborated with Doug Murano and C.W. LaSart on a collection of horror stories called Gruesome Faces, Ghastly Places. All three authors are from South Dakota, and several of the stories are set in SD as well.